Today Verizon Wireless, Motorola, Google and Adobe took the stage at a press conference in New York City to announced the new Droid X, Verizon's latest in its series of Android devices. The Droid X is a slab-style touch phone. It has a 4.3-inch screen with WVGA resolution (854 x 480 pixels), HD video capture and playback, HMDI out, streaming DLNA support and streaming video content. It can use its internet connection to create Wi-Fi hotspots for up to 5 other devices (additional $20 per month). It also has a 1GHz Texas Instruments OMAP processor and an 8 megapixel camera with mechanical shutter, autofocus and dual LED flash. It will come with a lot of video content, such as V CAST Video, NFL Mobile App, BlockBuster, Skype Mobile and Back-Up Assistant. It as 8GB of internal storage and supports up to 32GB in the microSD slot. The Droid X will be preloaded with Swype for easier typing on the software QWERTY keyboard. Other radios include Bluetooth, GPS and Wi-Fi. The Droid X will run Android 2.1 Eclair at launch, but will receive the Android 2.2 Froyo and Flash Player Mobile 10.1 via an over-the-air software update by the end of the summer. 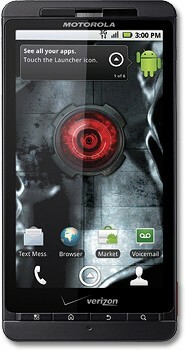 The Droid X will be available July 15 for $200 after a $100 mail-in rebate. Verizon Wireless said that any customer who's contract ends in 2010 will be able to upgrade to the Droid X at the upgrade price point. So after going through the incredibly boring presentation, Verizon's answer is a giant brick of a handset that looks like a giant turd. Let's be honest, this thing is no Nexus One or Droid Incredible (or even HTC Evo)... let alone iPhone 4. The original Droid hardware was pretty shoddy, this looks bad too. What happened to Motorola's awesome ID department? Won't ship with Froyo , perhaps the brightest news of the Android world.... so they're launching a new phone with obsolete software. Nice going guys. I've had Froyo on my N1 for 2 months now. You do realize the process that has to be gone through to get a software update pushed right? Like we've been saying every time you brought up this stupid excuse. Read up blue, you've missed some Froyo and Flash news over the last two days. Maybe take a break from Android bashing for a day or two and catch up on this. android phones garbage forces close every five minutes; so the best company its!!!!!! Blockbuster had an app prepped for launch, netflix didn't. I prefer netflix, but mobile video is mobile video. It's a failure and horrible phone Blue? Based on the few moments we've spent with the Droid X, it is a sure-fire winner. Verizon Wireless and Motorola are going to sell bazillions of these things. It impresses all the way around. We can safely say that Motorola knocked it out of the park. Again with them saying that the phone feels great in the hand, has an amazing build quality. Is 3x more usefull than arguing with Bluecoyote. considering this phone has most likely been in development for months. It's their answer to the evo for screen size, but I'd hardly call it "too little to late." This phone is amazing, and please dont let blue coyote convince you otherwise. I would love a version of this phone on Sprint though. I know it is off topic, but why is Phonescoop clowning me about my OLD browser? "You appear to be using Internet Explorer 6. This is an extremely old browser that does not support modern web standards. Our upcoming redesign will not work properly with IE 6. Soon, you will need to upgrade to a modern web browser in order to continue using Phone Scoop. We recommend Google Chrome." The day before that "other phone"
This should be an interesting summer with the phone companies trying to beat each other with new phones. "No. 1: No Verizon iPhone."